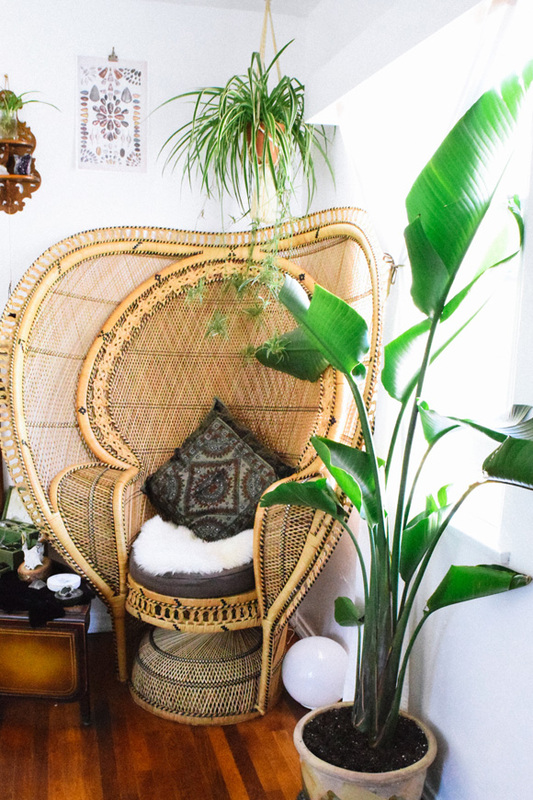 It’s Katie’s birthday as we write this, and as she’s an unabashed and unrelenting birthday princess (birthday is a misnomer, it’s more a birthweek or even month), we thought a post on peacock chairs – the thrones of bohemian decor – was particularly apt. Peacock chairs show up fairly frequently on Craigslist, and we’re often tempted, but we each have a hard time imagining them in our current homes. 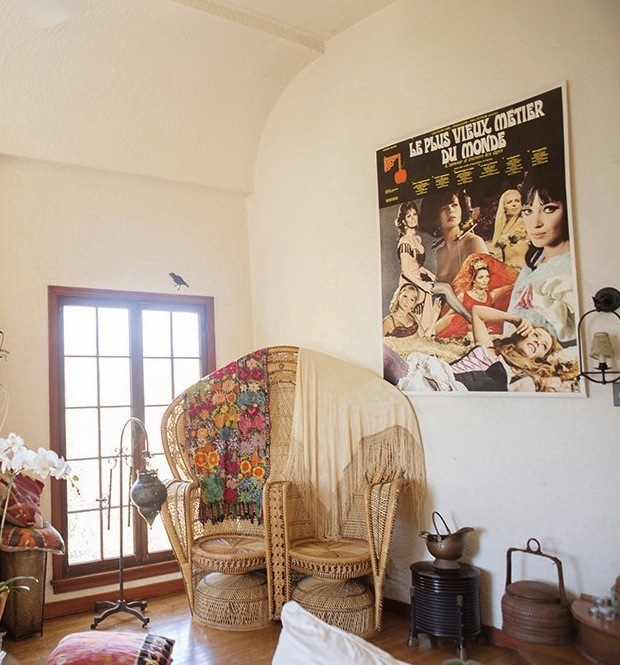 While bohemian decor is expansive and can include elements recognizable from lots of other styles, the converse isn’t always true; some staples of bohemian decorating are only ever at home in a bohemian setting – and we think that may be the case with peacock chairs. Today we’re taking a closer look at when and why they work, and considering why we haven’t snatched up our own. This classic peacock chair looks like the perfect perch for watching frigates and boobies soar above the crashing waves. Though one must occasionally get up from this airy cathedra to prune back the jungle and preserve the view, leisure rules supreme. In this space the white peacock chair looks like the ultimate thrifter’s throne. We’d like to count ourselves among this royal family. 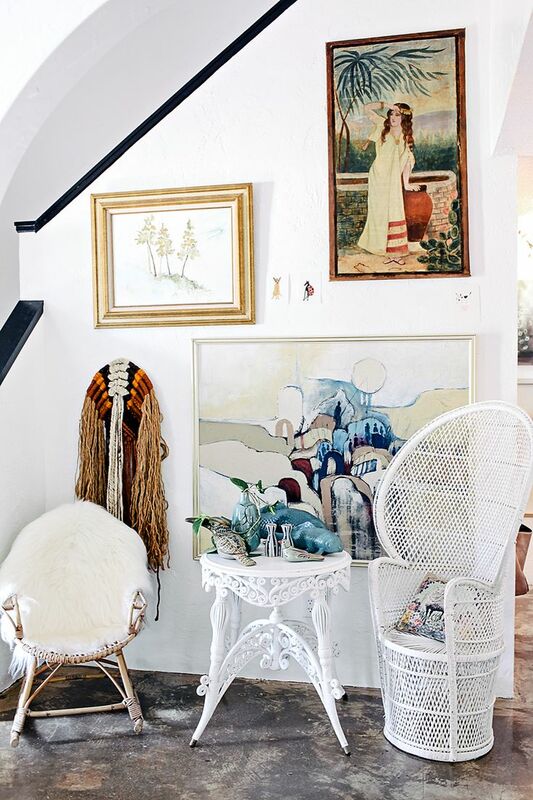 As demonstrated in these next few photos, peacock chairs pair well with other bohemian staples — pom poms, piano shawls, and sheepskins. In this room instead of being draped in sheepskins and shawls, the chair is left to its basic form. It’s like a sturdy stalk for the plants it accompanies. There’s no question that all of these spaces, and the chairs in them, are lovely and inspiring – so what’s our hesitation? We think it comes down to the fact that peacock chairs are truly throne-like, in that they look more ceremonial and ornamental than comfortable. It’s a little strange that something almost synonymous with a laid-back setting confers such a rigid and upright posture. That said, they’re almost pretty enough to have just for their sculptural qualities, but it’s hard to imagine them in spaces that aren’t 100% bohemian – and our design tastes and styles are just too varied to be 100% anything. What do you think, could a peacock chair work in your home? Hi ladies! And happy birthdweek, Katie! (I’m a big believer in celebrating birthdays, too). This is a great post because it could be applied to a few other things as well. For example, for years I have desperately wanted a cow skull, long horns, to hang in my living room. We love Santa Fe and have been there several times and each time we go, I think I’m gong to get one. But then I think how ridiculous it would probably look in my New England cedar shingle home. (I haven’t completely given up on the idea, however). But anyway, as for peacock chairs, I’ve been going in a slightly more Bohemian direction lately and I’m starting to wonder if I’m going too far. Only because I really don’t want to box myself in to any one particular style. 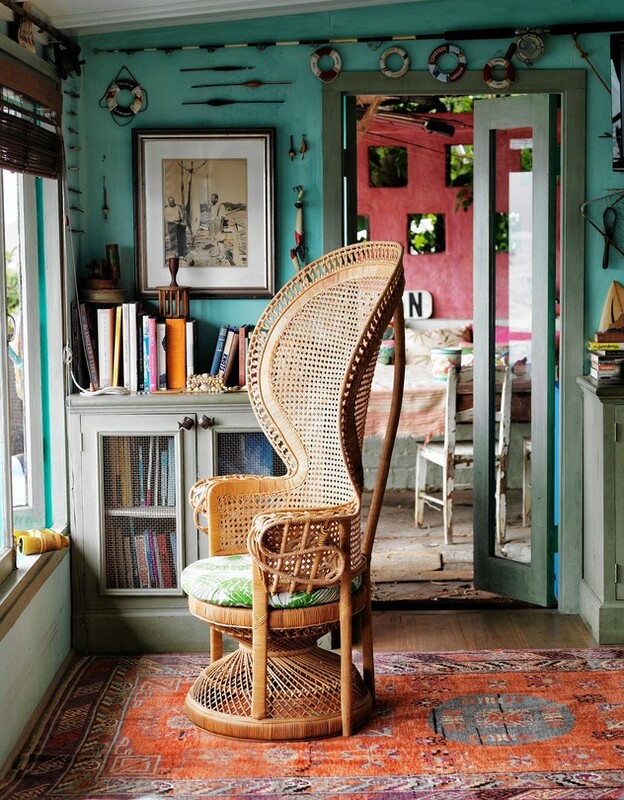 So for me, a peacock chair would definitely put me over the edge and would take my home in such a distinctly Bohemian direction that it would be all wrong. Thanks for the birthweek wishes! My usual philosophy is ‘if you love it you can make it work,’ but the peacock chair might be the first exception found to that rule. I’ve got full faith in you making a skull you’ve been pining for for years work though! Happy, Happy Birthday Week Katie! (at least a week) And I wish you had a storage shed – a huge one (invisible behind some wonderful garden feature) where you could store one of these chairs (preferably the double one so you could sit next to Cameron) and pull it out during a celebratory period! 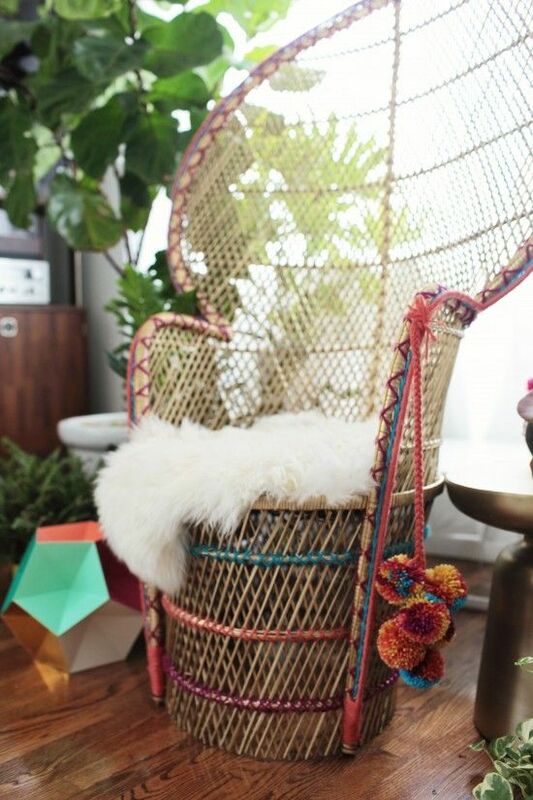 Such a throne – not iron but rattan! (And no, not here, I think the smallest one is one-quarter of my living room.) Loved the photos though – always a treat. Thanks for the wonderful, wonderful wish dear Katy! Happy birthweek, Katie! This post ID’d my major objection to peacock chairs: many look uncomfortable and even flimsy and tippy. Chairs have to pass the sit test–no space here for style with questionable function. Also: cats. Anything woven seems to be a cat magnet and would show the effects of regular clawing. I’m with you! 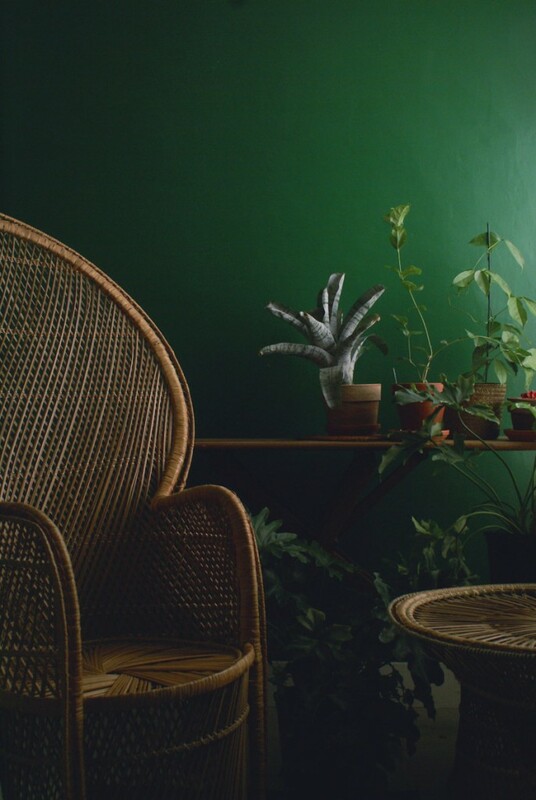 A peacock chair might have made the cut during those halcyon days just after moving into our house, when it seemed that space was endless and function was negotiable, but definitely not now. This is my objection, too! They don’t look comfortable to actually use, yet they appear to take up a lot of real estate. I just returned from a 2-week Mediterranean cruise (did you miss me??) during which we celebrated my husband’s birthday (Nov 4th) and our upcoming 30th wedding anniversary in December. We sat in peacock chair “thrones” at our wedding reception all those years ago. Your silence was deafening, Nina! Welcome back. Happy almost anniversary! For $30 on Anchorage Craigslist, you could give a peacock chair a whirl: http://anchorage.craigslist.org/fuo/5299298450.html. I saw this listing yesterday morning, and read your post this morning – it seems like the peacock chair might just be meant for Mera! Also, I recently purchased one of those coal foot warmers with no idea what it was for, other that I thought it would pretty and would be a brilliant SOMETHING (footstool, side table, plant stand…). I love it, and am so glad I now know its original purpose! You found the Craigslist listing that inspired this post! I love it, but just can’t pull the trigger. Sounds like you found a treasure! Well I can see how a peacock chair in my house would be most befitting of the resident royal felines (and would double as a great scratching post)! However, as a child of the 70’s, I can attest to how uncomfortable they really are. Add to that their girth and Prom King and Queen connotations—I’m not a big fan—though these images pull them off pretty well! Thanks Michelle! Dean – like the portly royal feline he is – would love to curl up on one of these, and if chair real estate weren’t so precious in this house I’d consider it–just because he’d look so dang cute. I’m sure these chairs are impractical and uncomfortable and irresistible to cats, but oh, I love the way that one in the first photo looks as it sits before the window that you KNOW must look out onto the ocean. It almost seems as though these chairs were made to fit into corners and to be surrounded with foliage. Happy, happy Birthday, dear Katie! I do think you should be sitting in a peacock chair when you blow out the candles on your cake. happy b-day. this brought me back to my college days when a friend, with a bit too much enthusiasm, sat back on the chair and tipped over. it was quite a sight, but there were no lasting injuries. i often wondered where that chair ended up. i think it is in that first photo.